Almatech performs the design, engineering and MAIT of the thermal hardware and its support system to be on board the Exomars 2020 Carrier Module. See below for more details about the mission. The thermal hardware configuration is mainly composed by External and Internal Multi Layer Insulation (MLI) blankets. The External MLI Tents are required to cover the volumes between the inside of the radiator panels and the Descent Module with MLI on the outside of the radiator and HDRM support panels. Other External MLI are foreseen to cover the rear of the deployable Solar Array panels and the Sun-facing part of the central tube. External MLI is also required to cover the RCTs; due to the thruster plume impingement this MLI has to withstand a higher temperature range. As far as concern the Internal parts of the Carrier Module, the MLI blankets are required for covering tanks, batteries, RCS units and tubing. Additional MLI blankets are foreseen between the Solar Arrays and the CM structure, in order to reduce the heat flux coming from the Solar Array located on the centre of spacecraft. Establishing if life ever existed on Mars is one of the outstanding scientific questions of our time. To address this important goal, the European Space Agency (ESA) has established the ExoMars programme. 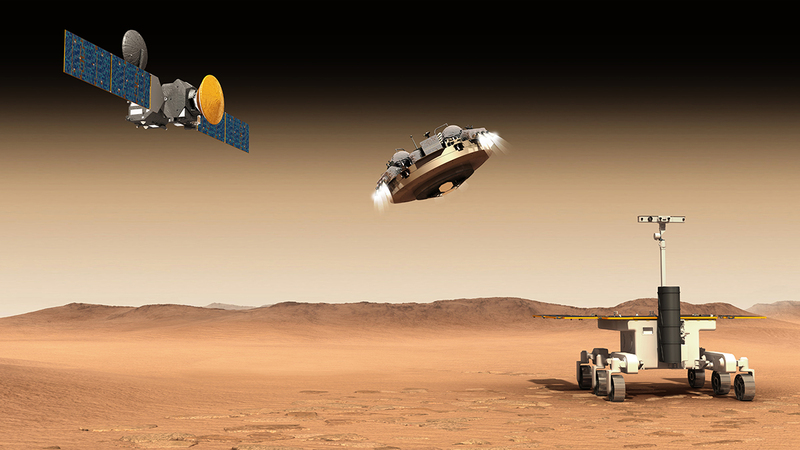 Two missions are foreseen within the ExoMars programme: one consisting of the Trace Gas Orbiter plus an Entry, Descent and landing demonstrator Module (EDM), known as Schiaparelli, launched on 14 March 2016, which crashed and the other, featuring a rover, with a launch date of 2020. Both missions will be carried out in cooperation with Roscosmos. The ExoMars 2020 spacecraft has the primary objective of safely delivering a rover module to the surface of Mars, with a nominal launch date in 2020. The Carrier module, part of the Spacecraft Composite is devoted to transfer the Descendent module and Rover Module to the vicinity of Mars after separation from the launch vehicle.